SUBARACHNOID SPACE's most "different" album, as it features lots of guest musicians and additional instruments such as cello, hammer dulcimer and violins. "Endless Renovation" is definitely an ambient and spacey release, all pieces of music consisting mostly of live improvisations recorded in studio. The songs here are very slow, rather elongated, calm, sometimes dissonant but always trippy, alternating relaxing and angrier moments. It opens with "Will You Make My House a Carnival ? ", an organ dominated tune evolving with apparition of guitar and synthesizer textures. The track has some echoes from medieval and oriental music. Back to freak-out stoner rock with "Square Wheels", a true descent into madness with its crazy guitar and drum playing. The shortest song of the album, "Good Grief ? ", is also one of the spaciest with its mysterious and vaporous atmosphere. "Stereo Saturation" is both ambient and rocky, as if you were travelling into space while observing star collisions. The album concludes with its two longest improvisation, "Safety in Numbers" and "Twilight Sleep", featuring top-notch slow, dark and growing psychedelia, evolving slightly with changing sounds. The cello contributes well to an atmosphere of an "unknown" world. "Endless Renovation" is one of the most interesting and adventurous albums from the band, revealing sometimes unexpected jazzy feels. Furthermore, extra instruments manage to bring something new to the music. The tunes are sometimes too elongated and too ambient, but always very inspired. 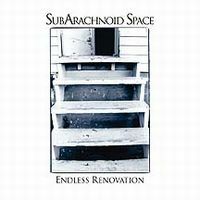 SUBARACHNOID SPACE is renovating psychedelic rock.